Research shows that children who attend school regularly are likely to be successful. A child who misses a day of school each week misses an equivalent of two whole years in their school life. Missing school leads to gaps in education that become difficult to fill. Telephone you, firstly to check that you are all safe then to ascertain a reason for the absence. If telephone contact cannot be made, we will send you a text asking you to contact school. If there is still no response from you, our Attendance Officer or a member of staff will call at your house to check that you are safe and to ascertain a reason for the absence. If there is still no response when we visit your home, we will understandably be very concerned for you and your child's welfare and we will ask the police or social care to carry out a check. As school meals are now cooked to order, we must ensure that meals are ordered by 9.30am so that the cook can begin to prepare the appropriate meals. If you normally order meals online for your child and they are going to be absent, please go online and cancel their meal (we will do this for you if we notice that this has not been done). If you are to come in late for whatever reason, please make sure that we know this so that meals are not cancelled unnecessarily. School will be very concerned if any child’s attendance falls below 90%. We understand that children are ill from time to time, but if attendance falls to this level, we will contact you to ensure that you and your child are not in need of any additional support. We will speak to parents/carers about low attendance as it occurs. Our Attendance Officer may call at your house to offer support or we may ask you to call in to school to discuss this. Our priority is to ensure that you and your child are safe and your child receives the best possible education that they can and we can only do this if they have good school attendance. We are here to support you if you or your child is finding coming to school difficult, so please speak to us if you need help and we will do everything we can to support you. Please also help your child by ensuring that they are in school on time. The beginning of the day is very important as it the time when instructions for the day ahead are given to your child. Your child may also be part of a group that takes place at the beginning of the day where they receive additional support to boost their learning and missing this means that they are missing out. The school yard is manned from 8.50am and the bell rings at 8.55am. We offer a 'drop in breakfast club' from 8.30am each morning for children in Y2 to Y6 and for the small cost of 20p per day your child can enjoy breakfast (toast/crumpets/milk/water). Why not encourage them to come along and enjoy this club. Government legislation now dictates that holidays are not permitted in term time. 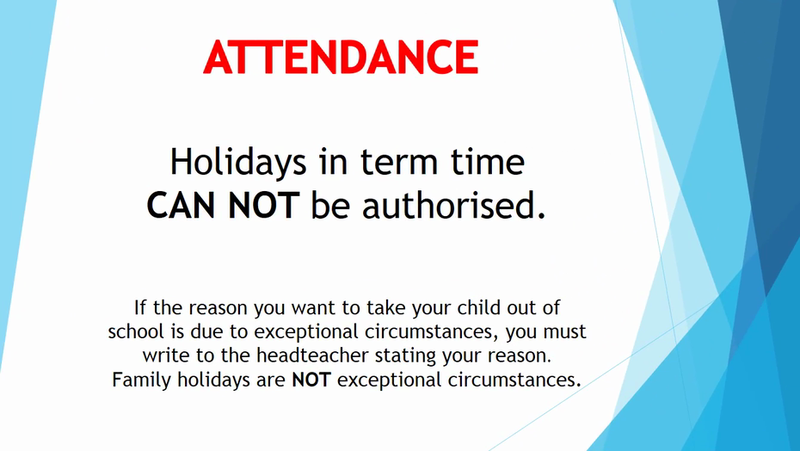 Holidays in term time will only be permitted in ‘exceptional circumstances’. If you feel that your reason for taking your child out of school is an exceptional circumstance, please speak to the Headteacher, who will ask you to put your request in writing. Unfortunately school cannot authorise absences for weddings or other family celebrations. Ensure that your child has breakfast and be careful about what they eat - Children of all ages need a nutritious breakfast. Snacks, sweets and drinks that are high in salt, sugar and additives are not a good start to the day. Be interested - Make sure you have time to talk to your child about school each day, find out what homework needs to be done, read with them and sign their home/school book. Your child is more likely to want to attend school if they feel supported and their anxieties listened to. Be positive - Problems in school may occur with other children or with their work. 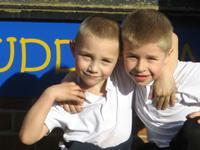 Reassure your child that you and the school will work together to provide help and support. Be firm - Unless your child is too ill to attend then he or she should be in school. Make sure your child understands that you do not approve of them missing school. Be clear with the school - If your child is too ill to attend school then contact the school on the first day of absence and keep the school informed. Be aware - You should not take your child out of school for a holiday during school term time. Be available - Let the school know how you can be contacted and provide emergency telephone numbers. Be involved – speak to your child’s teacher or the head teacher if you need to and attend parents' evenings. Having a good education will help to give your child the best possible start in life. If your child does not attend school regularly he or she will not be able to keep up with the work and may miss out on other aspects of school life. They may find it difficult to form friendship groups or to sustain friendships and may miss out on social events. Every lesson in school matters and if children are often absent it will result in gaps in their learning. This may interrupt the continuity of their education and impede their progress. Setting good attendance patterns from an early age will help your child later on in life. Employers want to recruit people who are reliable; therefore children who have poor attendance may have less chance of getting a good job. Research has shown that children who are not in school are most vulnerable and are easily drawn into crime or anti-social behaviour. Instilling good attendance during primary school, usually leads to good attendance throughout their school life. Why is it important my child arrives at school on time? Arriving late at school may be embarrassing for your child. It may disrupt the class if your child arrives late. Your child may miss something important e.g. lesson plan, instructions on how to complete a piece of work., phonics or other interventions. Social interaction with peers before school is important if your child is to form friendship groups. To instil good habits. Punctuality shows reliability. This is a valuable attribute for future working life. So your child gets their registration mark. At Brook Street, we want every child to achieve their best in life, so let’s work together to ensure this happens. If your child is in school every day and on time we can then play our part in ensuring that your child has the best possible education.